Hey guys! Can y’all believe the holidays are officially here?! It feels so good to have our tree up in our new house and have Christmas music on blast. I’m sharing another fun outfit with Bobeau today featuring the coziest faux fur cardigan that has officially become a staple in my cold weather wardrobe! When it comes to winter, give me allllll the faux fur so naturally when I saw this cardigan I had to get in my closet ASAP! It fits a bit like a poncho (but not as bulky) and is perfect for layering. On a warmer day you could wear it with a simple tee like I did here or pair it with a long-sleeve or turtleneck when the temps drop. Oh, and did I mention that the fur is detachable? It’s attached with buttons so you can easily remove it if you’re not feeling the fur that day. I also love the little pockets in the front and I know this is a piece that will stay in my closet for years to come because hello, it’s a neutral plus it’s so versatile! 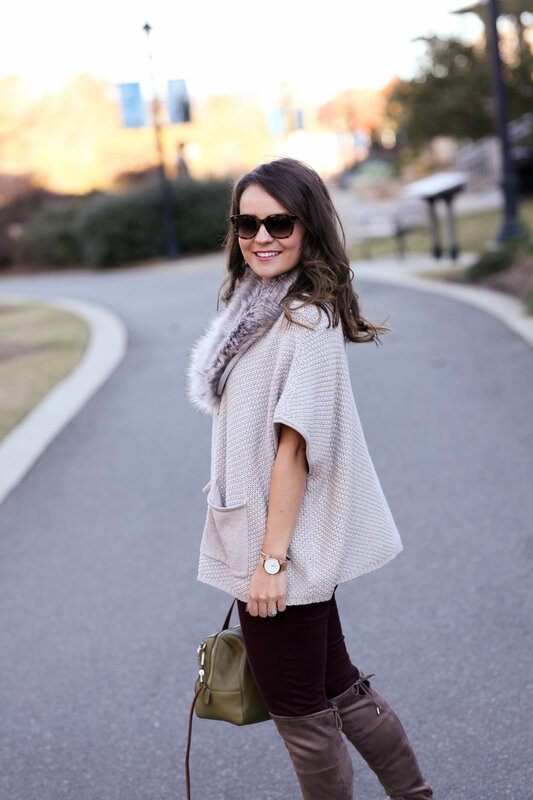 I paired this cozy sweater with my burgundy skinnies (love these), OTK boots and my go-to olive handbag. I always get compliments on it and people are still shocked that it’s Vera Bradley. Their leather stuff is so good, y’all! I also recently picked up this tortoise link bracelet from J.Crew Factory and just think it’s the cutest. It’s chunky but lightweight and under $20! Love this cardi as much as I do?? Well, it’s currently on sale for 35% off AND be sure to enter Bobeau’s giveaway to win a $1,000 shopping spree to their site here. Thanks for reading and hope y’all have a great day! That looks so comfy! Would be amazing for travel. I love this cardigan lady! so perfect for this time of year! This is the cutest cardigan! I love that it’s short sleeved so you can layer if you want, this weather has been so crazy that this would be perfect! Such a cute and cozy outfit with great details. I am LOVING your bag!! Such a pretty cardigan!! Give me anything with faux fur and I’m happy! That does look so incredibly cozy! I also need those otk boots! Awww so pretty! I love this whole look! The cardigan is so pretty. Oh how cute is that cardigan?? You don’t even need a necklace or a scarf with this outfit because the cardigan has all the “accessorizing” down for you! Too fun! That cardigan is so cute, I love the collar and oversized pockets! i LOVE IT PAIRED WITH THOSE PANTS! That cardigan is so cozy looking & just perfect for the weather this time of the year! I’ve been looking for great red pants too, and I need to check these out! Love the faux fur collar on this cardigan and the adorable zipper! Such fun details. Love your cardi! So chic!